The dive site SAS Transvaal is a recent wreck in the Smitswinkel Bay area on the False Bay coast of the Cape Peninsula, near Cape Town in the Western Cape province of South Africa. 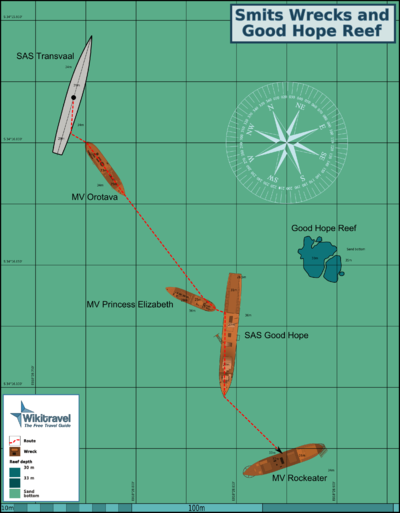 The SAS Transvaal is the northernmost of the 5 wrecks in Smitswinkel bay. "HMSAS Transvaal" F602 was one of three Loch class frigates transferred to South African naval forces while under construction. The ship was laid down at the yard of Harland and Wolff as HMS Loch Ard, and was launched at Belfast on 2nd August 1944 as HMSAS Transvaal. The ship was sold for scrap and scuttled by explosive charges in Smitswinkel Bay to form an artificial reef on August 3rd 1978. The sinking of these ships to form artificial reefs was opposed by the Department of Sea Fisheries (now Marine and Coastal Management), which at the time threatened legal action, however the vessels were sunk according to plan and have caused no recorded ecological or navigational hazard. The visibility on the wrecks in Smitswinkel Bay is often better than at sites closer inshore and shallower. This may be due to less water movement at depth. Visibility on a good day may be more than 10m, and on exceptional occasions has been more than 20m, but do not be too disappointed if it is no more than 6 to 8m. The wreck lies more or less upright on a flat sand bottom with bows to north east. The wreck retains its shape to some extent, though rust is taking its toll and the mast has fallen to the port side. The hull structure is collapsing and may be unstable. The Bows have broken from the rest of the hull just aft of the foredeck winch and have fallen over to starboard. Aft of this the foredeck has sheared off the topsides along the starboard gunwale and subsided into the wreckage. The upper deck aft of the forward gun mount has collapsed, taking with it the remains of the forward superstructure. Aft of this the upper deck is open above a machinery compartment, where some heavy equipment is still moderately intact. The quarterdeck is in relatively good condition. The deck plating has wasted away between the frames in many places, but the hull plating is mostly intact and the rudder and shaft brackets are still intact. The wreck of the trawler Orotava lies a few metres off to starboard about 20m forward of the transom. Geology: The bottom of the bay is flat fine white sand. There are no rocks in the immediate vicinity. This site is only accessible by boat. It is about 5.1km from the slipway at Miller's Point. The wreck is too deep for much seaweed, but it is heavily encrusted with invertebrates, some of which are seldom reported from anywhere in this region except the Smits wrecks. Recent wreck of World war II vintage warship in moderately intact condition. Much of the structure is identifiable, and there is a large amount of machinery inside the wreck. The water is usually quite green, and carries a lot of suspended matter, so macro photography with flash is the easiest option. Skilled photographers with fast lenses may manage good scenic photos with artificial illumination filling in the foreground, but most point and shoot cameras will not manage this, and you may be better off just trying for natural light shots with a wide angle or fisheye lens. No particular route recommended. The wreck is fairly interesting from end to end. Challenging penetrations are possible, but the structure is collapsing and may be unstable. If you are interested in old, encrusted and difficult to identify machinery and equipment, the central part of the vessel provides vertical access to machinery compartments filled with this sort of stuff, which can be seen to a reasonable extent without actually penetrating the wreck. The structure has become unstable due to corrosion, and there is a risk of collapse if there is a strong surge. Penetrations should be planned with this risk in mind. There is fine silt deposited inside the wreck, and if this is disturbed the visibility will rapidly deteriorate. This could disorientate a diver and make it difficult to find the way out. This page was last edited on 20 May 2011, at 16:31.